The Chicago White Sox, my favorite baseball team, have hit the skids in their quest to win the division. They seem to have a lackluster attitude and they just don’t get things done. They’re terrible at bringing people home when they’re in scoring position and they’re not making good defensive plays. In other words, the team isn’t executing well…or at all! Two losses ago, Scott Podsednik said the team needed to play with more intensity. The Manager echoed those statements. Well, the Sox lost the next game in spite of Podsednik hitting a clutch home run as a pinch hitter. Podsednik had it right. Intensity needs to be there. In fact, execution and smart play is a function of intensity; as intensity goes up (to a point) execution and smart play occur in a more repeatable fashion. Why does intensity going up “to a point” make a difference? Think of younger athletes playing a sport like soccer. They run vigorously up and down the field, sometimes never even touching the ball but nonetheless they’re all sweating as if they’re playing active roles in moving the ball downfield and into the opposing goal. The truth is that perhaps only one or two people are actually doing any useful work; the rest are running around willy-nilly. To that end, Konerko is correct, execution and smart play is better than intensity. But, I don’t think that’s what Podsednik meant. When people focus their intensity, they enter that ‘zone’ where everything works. People don’t usually make stupid mistakes when their intensity is focused. People don’t fail to execute when their intensity is focused. So why this baseball based diatribe? Because it’s our lesson as well. Repeatably being on the top of our games will not happen without some type of intensity. Whether it’s solving problems with cool new ideas, coming up with a new piece of art or music, or keeping from getting into an accident while driving in a snow storm during rush hour, intensity is the lens that makes fruitful results possible. So, next time you’re not getting the results you want, look at how well you’re focused. It doesn’t take that big of a lens to start a fire using the suns rays. You are that bright light…bring some fire to your world! 1. Touch is an amazingly sensitive sense and under-utilized, though some designers are catching on. 2. Instead of trying to solve a problem in its unity, break it apart into smaller pieces. In this case, breaking speech down in three ways gives a more holistic picture of what’s going on. It’s interesting that the tongue isn’t directly contacted and yet intelligible speech is still able to be interpreted through these three modalities (throat, lips, nose). Perhaps if there was a way to feel the tongue without interfering with the words, speech could be learned even better? 3. People are amazingly adept at translating inputs from one realm and using it for another. 4. There are great payoffs for those who are willing to learn a little at a time, but you need to always keep the big picture in mind while learning or you’ll never get started. 5. Think of the patience and commitment of Helen Keller’s teacher! What would the world be like if everyone had that type of perspective when helping others? While doing some additional patent work I came across another slick tool called Patent Cluster. What is really great about this tool is that it has a choice of viewing patent search results in ‘List’ and ‘Visualize’ modes. Visualize mode results in an interactive graphic that subdivides patents by topic. Its only weakness is that it doesn’t seem to capture as many patents as a search at the USPTO. Want to take it on a test drive? A screen capture for a search on the word, “antimicrobial” resulted in the following graphic. Click on it and it will take you to the actual search page where you can play with the interface yourself. 10 Suggestions for Getting Healthcare Discussions on Track – We Need Politicians to Be Innovative! We hear politicians speak of innovation yet they fail to live innovation themselves; they fail to find creative ways of working together to make the healthcare of this country better, of designing systems of healthcare that meet the needs of the most (that incidentally cover the politicians as well as the people) in the most sustainable ways possible. Oh, as a point of clarification, the status quo is also not sustainable so it is not a solution. 2. All legislators are required to work for one month minimum finding ways of meeting the needs of the constituencies on the other side of the aisle. 3. Instead of reinventing the entire system, find the gaps in the current healthcare system and fill those. One way to find the gaps is to write an obituary for 5 years down the road for the US and its healthcare situation. Chances are the things that bring about our demise are due to gaps of some type. 4. The 102 Idea webpage in Illinois is something that every State should be implementing. Ideally though it should be bi-partisan. Rule #1 on those pages: NO Complaining about a situation or about what others are doing. Rule #2: No patting your Party on the back. 5. Create a list of the best things that other Countries and States do related to healthcare. Combine them to create something new. 6. Create a list of the best programs in other States/Countries not related to healthcare. 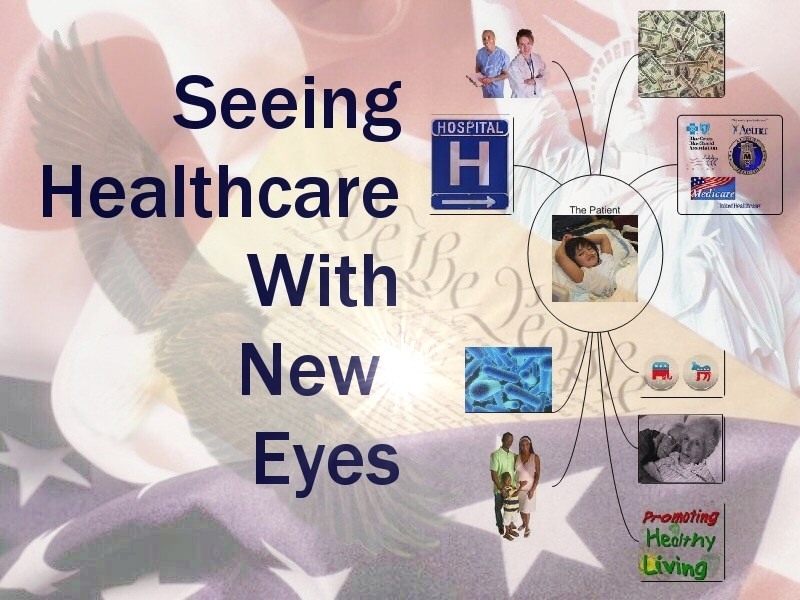 What can be learned from these programs and applied directly or modified to the healthcare situation in the US? 7. How would a poor Third World Country solve our healthcare crisis? Use this exercise to generate ideas. 8. Create a list of the strengths and weaknesses in our current system. Come up with solutions that maximize the strengths and minimize the weaknesses. 9. Create a list of the facts regarding healthcare and stick to these at all times. An orthopedic surgeon does not make $40,000 per procedure to amputate a foot. Except for Ukrainian Pirates. These folks bring customer service to a new level. As Ukraine’s borders opened in the 90’s, entrepreneurial merchants in Ukraine travelled regularly on buses to central European countries to obtain goods to resell in Ukraine. The routes of these trips became well known to bandits of the underground who would raid the buses on their return legs and take the goods. That’s all well and good but additional robbers would come by at other points of the journey home and pirate the same bus again…and again…leaving everyone frustrated. To prevent any misunderstandings with future bandits ‘Certificates of Robbing’ were issued to the victims after they were robbed. That way, when the bus was stopped again by wouldbe pirates, the certificates were presented thus assuring the crooks that yes, this bus had been robbed and nobody was hiding anything. There’s a lesson here about creative customer service…. Dutch researchers found walking backwards may help with problem solving. Over on LinkedIn I came across a new website that offers some intriguing Artificial Intelligence and Pattern Recognition webtools. But the one I like the most is the Patent Search tool that not only shows patents in the field you’re looking in but allows you to get an approximation of the value of each patent. 1. If a box is outlined, it means the patent in that row belongs to the subclass of the column. 2. The number in the column/row intersection is equal to the number of subclasses in the patent plus the number of patents from the search that are in that subclass. The higher this number, the more valuable the patent can be seen to be. 3. The shade of blue helps carve out islands of similar groups of numbers. After you run this search you can check on the patents you’d like to look at more and click the ‘Find Similar’ button to obtain a sorting operation. Personally I like this engine. I even found some other patents that didn’t show up when doing other web based searches. I also like how the various relationships between various patents and classes are depicted. It does give a great lay of the land in that respect. It also excels in showing where there might be holes in the patent landscape. After talking to the developers of this tool, they made it clear that they have much more in pipeline from a development perspective, so this search engine is destined to become cooler and more useful still. Personal Brain is just such a product. Touted as an information management tool, it is essentially mindmapping – its graphic interface and ability to “re-center” is pretty slick. What is “re-centering”? Typical mindmaps start with one idea in the middle and the ideas branch off. This starts the same way but then with a click, any one of your satellites can become your new center. I could see this really helping for brainstormings. What is also cool is they have created a web presence for folks to upload their “brains” to the web. There is some pretty cool information there. If there is a downside for this software it’s that when there’s a lot of information the interface can look pretty daunting and somewhat crowded; the flip side is that it highlights the complexity of the connections between information. How much does this software cost? The basic version is Zip, Zero, Nada, Nichoho. You can download it and use the Pro version for 30 days after which it defaults down to the free version which I think would be adequate for most users. The higher end versions are geared towards more intense information management and lend themselves well to a corporate environment. I could see this being used for managing a product/problem portfolio on a network level. Their website is also chock-full of educational info like this webinar on using the tool for presentation purposes. All in all, a really cool product and one that I’ll be utilizing for sure. Creativity does not flow in the din of that river of eddies and vortices!